Update 2015-09-17: in order to prevent confusion, we renamed Min daily income to Wanted daily income, everything else in this article should be valid. 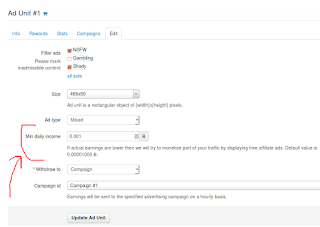 We developed a feature that enables publishers to indirectly set the minimum price of their traffic by specifying the Min daily income parameter. Advertisers compete for free affiliate impressions by rewarding the sources of converting traffic. 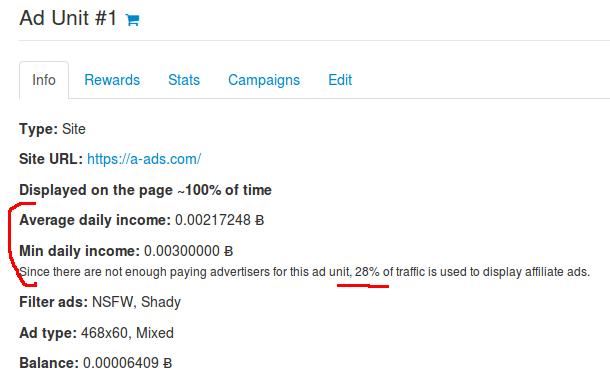 If Min daily income is too high then most of the traffic will go to affiliate programs while the remaining traffic will become too expensive for advertisers. 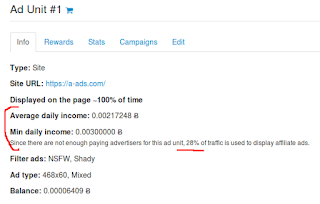 If Min daily income is too low then the price of the traffic will be determined solely by market forces, no affiliate ads will be shown for free. 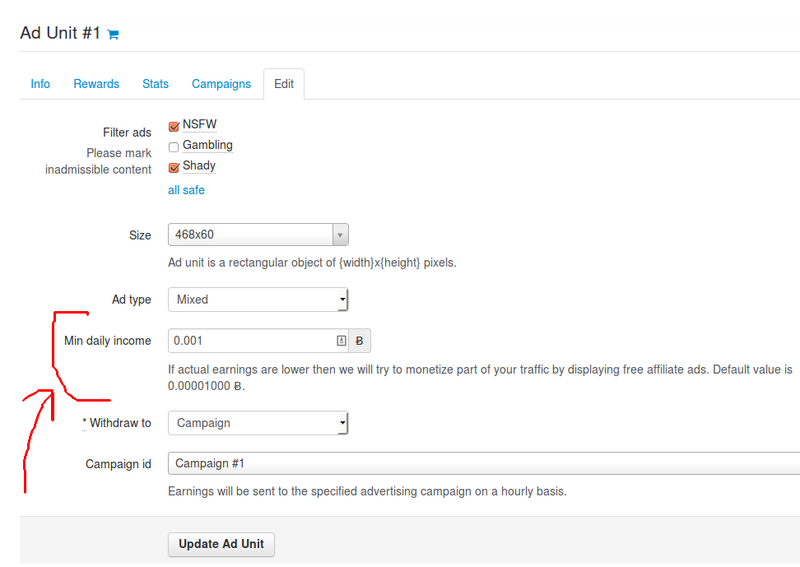 The default value is 0.00001000 Ƀ, so for new ad units 100% of impressions go to affiliate programs until they get paying advertisers. 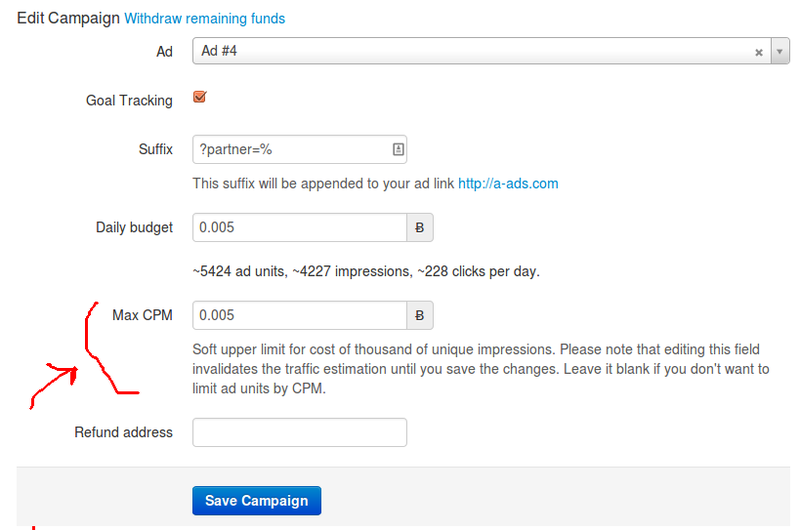 Advertisers can set Max CPM parameter to exclude ad units with expensive traffic from their campaigns. your daily budget will not be fully spent if there is no enough traffic that satisfies your criteria. If you don't want to worry about price and quality of traffic then find out how you can get free traffic and pay only after it converts.